No, I never was in the Special Ops, so no first hand experience. 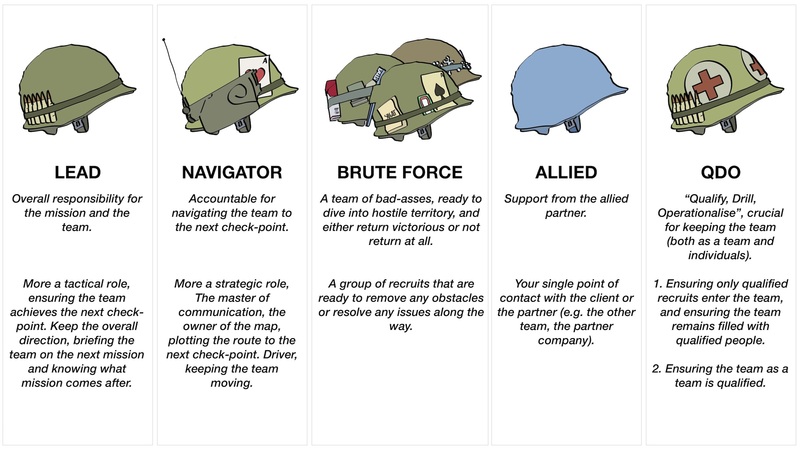 The closest I came to Special Ops was working for a company which was using a lot of military jargon, and trying to implement it. Missions. Drills. Really points. Etc. I say ‘trying’, because the jargon was used but never defined or explained, or even put in context of teams and project structures. So, here I found myself sitting in a bar in Munich at the main train station, just coming from a really point, reviewing our mission, having a beer and discussing all with a colleague. A fe things started to make sense. Especially confusing was the role of the navigator. We did not call it the navigator, but called it the ’20’ (as opposed to the lead, who was the ’80’). “Who is your 20 [soldier]?” What is the role of a 20? Was the 20 simply the 80’s minion, to off-load tasks too? Or to be your the replacement in case of your absence? Then again, when you are on a mission, can you ever be absent? None of it made sense, and the approach for most of us seemed to be to just copy the jargon, use the same terminology. Keeping up appearances. It still does not make sense, but nobody notices. What I realised in the bar in Munich was that the navigator has a critical role. He/she gives perspective beyond achieving the next mile-stone, the next check-point. Communicating beyond the team, providing a wider view supporting the team’s operational effort achieving the mission. The navigator is the one with the maps, with radio communicating with base camp, I learned from looking into special operation team structures. Now it started to make sense. Difference between a view of the project in context (strategic?) and as opposed to the lead’s more operational view (tactic?). Looking back at my past projects I realise that the most successful ones where those were I either had a very good navigator, or where I myself was fulfilling the role of the navigator well. Projects where my navigator provided insights into the jungle beyond surviving the next obstacle. A link into upper management. A veteran experienced in navigating the waves of noisy politics.